Midrange Hoparlörler 2 adet ürün var. 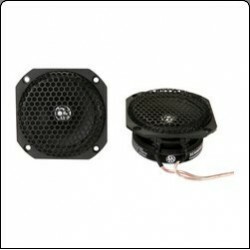 ULTIMATE series midrange speaker UP2,5i is a 63 mm (2,5) mid-dome with neodymium magnet but without chamber. The speaker does not require any box. UP2,5i is used in the UP36i 3-way kit, but can also be bought as separate units. Extra grille with different design is included. Crossovers are not included when bought separately. DLS Scandinavia 75 is a midrange specially designed for competition use. The extreme audio performance makes it a winner in every Pro installation.